Inspired by and modeled after Kipling’s The Jungle Book, The Graveyard Book tells the story of a boy raised by the denizens of an old graveyard: ghosts, spirits, and the occasional werewolf and vampire. The boy is adopted by the Owens, a childless couple, and since his real name is unknown, he is named Nobody Owens, or Bod for short. How does a toddler end up all alone in a graveyard, anyway? As the story begins, Bod’s family -- mother, father and sister -- are all knifed by a sinister character called Jack. By pure chance, the toddler manages to climb out of his crib and walk to the nearly nature reserve (the old graveyard). By the time he gets there, his mother, already dead, appears as a spirit and begs the local community of ghosts to take care of her son. She cannot stay there by herself since she was not yet buried; and most ghosts and spirits can only travel within the limits of their “home” graveyard. The arch story is the mystery of the murder of Bod’s family, and the plotting of Jack and his comrades to complete the task by finding and killing the boy. But while the Jacks (they’re all named Jack) and their sinister plans appear from time to time, most chapters form complete stand-alone stories on the background of Bod’s unusual state. He grows up, learns about his environment, yearns for human companionship, and meets interesting friends and foes, both dead and alive. The relative isolation of each chapter bothered me at time, and some chapter/stories I liked less than others (“Danse Macabre” is one example of a chapter that contributes little to the whole). Still, I suppose this is a direct result of following The Jungle Book, which employs a similar structure. The reason for the murders that begins the story becomes clear only as the story ends. The closing chapters are tales of Bod’s coming-of-age and moving from the nether world to the world of the living, and how the threat of the Jacks is removed. The overall result is a fascinating book, a fantastic and welcome new addition to any library for (and about) kids. I’ve read several reviewers that wonder about the increased macabreness in recent children’s literature. I’m not sure I agree. 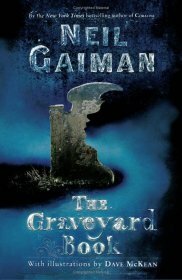 I certainly found no problem with the book’s general settings; if anything, it was the opening scene, the triple murder, that bothered me as a tad too violent than the rest of the book, making it somewhat less suitable for younger readers (even though the murders take place entirely “off screen”). But my generation, and certainly the ones before it, grew up with stories that contained horror, fear of death, and actual death of key characters --- from the fear in Treasure Island to the death in The Paul Street Boys, not to mention the horrors of the Grimm brothers' stories. If anything, the return of death to modern children’s literature is a return to normality, in some sense, a removal of protective shields that became a bit too protective in the late 20th century. To receive notifications as new reviews are published, consider following the RSS feed.